You’re planning your beach vacation and you can’t help but want to bring your furry family members with you! After all, beaches and dogs seem to have an affinity for one another. Frolicking in the surf, romping through the sand and running full speed ahead are the makings of a perfect K-9, pet friendly afternoon. When booking your vacation rental, you may assume that all beach rentals in Sandbridge, V.A. allow pets to accompany their owners on vacation; however, this unfortunately is not true and those that do may have restrictions you should be aware of. If you’re hoping to book a pet-friendly vacation rental, it’s best to ask a few questions and do a bit of planning beforehand to make sure everything goes as you expect. Does pet-friendly mean cats are welcome? Typically, “pet-friendly” equates to “dog-friendly”. Unless a listing mentions cats by name, it should not be taken for granted that felines are welcome. Because of cats’ tendency to “mark their territory” when they are in unfamiliar place (and how difficult it is to remove the odor), most property owners do not allow cats. Cats also tend to scratch furniture which is undesired. With more people generally traveling with dogs it is easier to accommodate to just one type animal verse accommodating to the varieties of other pet’s people also have. What sizes/types of pets are allowed? You are likely to find a limit to the number and size of dogs you can bring. The average number is two and it is typical to find a size restriction mentioned such as small, extra-small, or medium. Make sure you read each property listing carefully before booking. With Sandbridge Blue 2 dogs are permitted in dog friendly properties. Vacation rental companies typically charge an additional fee or a deposit for pet-friendly rentals. Most weekly fees are a minimum of $100 per pet. Just one of the many benefits of booking through Sandbridge Blue is that Fido gets to stay at no additional charge! We love your pup being part of the memories you make while staying with Sandbridge Blue and we don’t want to charge extra to make that happen. Can I just bring my dogs to any vacation rental? Booking a property that is not specifically “Dog Friendly” and bringing pets anyway is in breach of any rental contract that states no pets allowed. 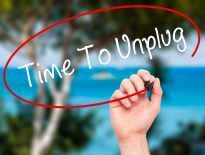 Your vacation may be cut short and that is no fun. Be sure to seek out pet friendly properties and enjoy a great time with the whole family, your four-legged members included! Is everything my dog needs provided? What are the town laws? 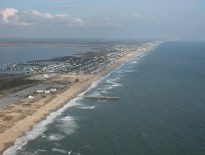 According to Visit Virginia Beach, in Sandbridge, V.A. pets can enjoy the beach all day every day in the spring, fall, and winter. However, between Memorial Day through Labor Day they are only permitted on the beach before 10:00 a.m. and after 6:00 p.m. Airtight containers for cleanup must be carried and used at all times. On a walk or on your way to the beach keep in mind that while walking on a city sidewalk or street your dog must be leashed or on a lead, and always with property id and licensing. Can my dog swim in the pool with me? At Sandbridge Blue, as with other rental companies, it is prohibited for your pet to be in a pool or hot tub. Dogs shed a significant amount of hair and body dander that will quickly ruin pool and hot tub pumps and filters. Also, the harsh chemicals are bad to ingest for your furry friend and it is difficult to keep a dog from drinking the water while they swim. Instead, take your pup to the beach and play in the waves then make sure to rinse the salt water off them when you get back. But no pool time for them. 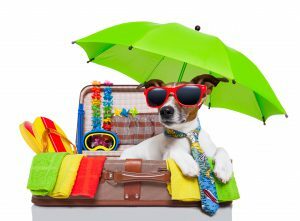 Before you vacation make sure your dog is ready to travel. Some dogs get anxious when they are out of their normal environment. This can lead to excessive barking, whining, chewing and other undesirable behaviors. When bringing a pet, keep in mind you are responsible for the manner in which they act and any damage your pet does to the rental property. With a little forethought, you and your K-9 kid can have a fabulous time in one of the most gorgeous areas of the country. Previous Previous post: Take a Leap! : Memory Monday February 14, 2017. Next Next post: Happy Monday! : Memory Monday February 20, 2107.